Goal United is a free browser-based game published by the makers of MMORPG hit Travian. 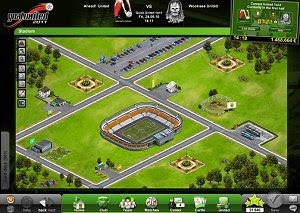 In this football (soccer) simulation game, players get to manage their own club and take it to the top of the league. Compete against thousands of other human players, each one with their club, settle on the best strategies and use trading cards to your advantage, ultimately enjoying a simulation game with beautiful and clean graphics, all served by an intuitive interface.